The Strategy Framework Canvas is a tool to help navigate through the sea of existing strategy frameworks. Since the 1950s, corporate strategy thinking has been evolving--new strategy frameworks are introduced each year. Today, there are literally 100s of strategy frameworks that have been developed by strategists, academics, and consulting firms. Each approach is driven by a unique business environment, characterized by 3 dimensions: Predictability, Malleability, and Harshness. The Strategy Framework Canvas helps us determine which approach, or combination of approaches, is most appropriate for various facets of our organization--i.e., for different business units, geographies, and stage of our organization's lifecycle. 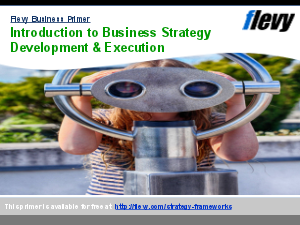 Additional concepts covered include historical chronology of strategy frameworks, pitfalls, case examples, leadership roles, the success trap, ambidexterity, sustainable growth, exploiters vs. explorers, etc. This deck also slide templates you can use for your own business presentations. Strategy Development? Bain Presentations? Channel Distribution Strategy Example? Or something else.